St. Monica School highlights vocations during Catholic Schools Week. Published 2/8/2019. Local. METHUEN -- During her many years of teaching at St. Louis School in Lowell, Donna Henderson liked finding ways to make Catholic Schools Week vibrant. Students might make cards for retired priests, or she might arrange a visit by retired Sisters of the Assumption, whose order founded the school. Now, in her first year serving as principal of St. Monica School, Henderson wanted to do something special for the day of Catholic Schools Week, that celebrates vocations. "I think so many times we're overwhelmed. This generation has so much stimuli, and my goal has really been to give them an opportunity to quiet down and contemplate, 'What does God want me to do?'" Henderson said. She had the idea of inviting priests and religious to talk with the students about vocations. She reached out to friends and associates and found several who were interested. 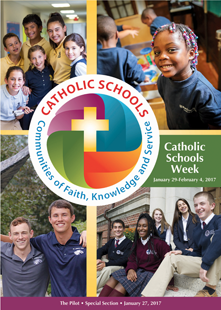 Catholic Schools Week took place Jan. 27 to Feb. 2 this year, with each day celebrating a different aspect of Catholic schools: parish, families, students, community, vocations, and faculty and staff. On Jan. 31, the day dedicated to celebrating vocations, St. Monica School hosted five religious sisters and three priests, including St. Monica Parish pastor Father Darin Colarusso, parochial vicar Father Joseph D'Onofrio, and Father Daniel Hennessey from the Vocations Office. While the other priests and religious visited the classrooms of the younger grades, Father Hennessey and Sister Irene Martineau talked to the middle school students about different types of vocations and shared their own testimonies of discerning God's will for their lives. Father Hennessey said he was in the eighth grade when he first thought of becoming a priest, but he did not tell anyone. In high school, he said, he thought if he had a job, a car, and a girlfriend, he would be happy. But when he reached those goals, he was not satisfied. "I learned that happiness usually doesn't come from things outside of us. Happiness comes from our friendship with Jesus who is within us," he said. He said he wondered, "Where does God want me to be most happy?" Eventually, he sought advice from a priest, who told him to pray about his vocation and listen for God's answer. "You have to learn how to pray because, if you can pray, then you can figure out all these things that are going on in your head and your heart," Father Hennessey said. He followed the priest's advice, and came to realize that God wanted him to enter the seminary and discern whether he was called to the priesthood. "The more I learned, the more I realized that I didn't need to worry about anything because he's God and he's totally in charge," Father Hennessey said. He said that deciding to follow God's will for him did not make everything in his life perfect, but gave him a kind of joy nothing else in the world could. Sister Irene said she felt called to religious life when she was in the first grade, preparing for her first Communion. She told the sister helping her prepare for the ceremony, "Someday, I'm going to take your place." That sister remembered those words when Sister Irene entered the religious life 10 years later. "Through all my years of education, I kept admiring and hoping and praying that someday I would be a religious," Sister Irene said. She explained the difference between a nun, who spends her life in prayer without connecting with the world, and a religious, who can have "all types of vocations in their religious vocation," such as working as nurses, teachers, or secretaries. She also talked about her long career as a teacher and principal, and described what her order, the Sisters of the Assumption of the Virgin Mary, was like when she entered it and how it changed over time. After sharing their testimonies, Father Hennessey and Sister Irene answered students' questions. Henderson later told the Pilot that she heard positive feedback from the students about the Vocations Day visits. "It was a wonderful experience for our entire student body. Students came up to me during their lunch stating how much fun they had speaking to our guests and hopeful they would come again soon!" Henderson said in an email. She said she hopes St. Monica School will continue to hold Vocations Day and build relationships with religious. "This is something I think they need constant exposure to. It's a good thing, and we'll find new ways to do it," she said.